If you’ve wondered whether it’s possible to save money while staying warm on a chilly, damp winter day, you’re in luck. LIBERTYAIR, an HVAC company in Gainesville, FL, offers these six tips to help you warm up without racking up your heating costs! When it’s chilly inside and out, you might not think of turning on the ceiling fan. But the same fans that provide cool comfort during the sweltering summer can also help you warm up — and save money on heating costs — during the winter. Most ceiling fans have a reverse switch located on the motor base which controls whether the blades rotate clockwise or counterclockwise. Flip the switch so the blades rotate clockwise in the winter. This creates an updraft that pushes warm air downward and into circulation. Any loose or missing roofing material can be responsible for cold air infiltrating your home. Repair any roof issues or hire a professional contractor to complete the work. A solid roof will allow warm air to stay in your home where it belongs and prevent you from bumping up your thermostat. Depending on the age of your home, the electrical outlets might not have sufficient insulation around the box. Any gaps around the electrical box and insulation in the wall can allow cool air into the home. The drafts are easy to remedy by inserting an outlet insulator behind the outlet faceplate. These small, pre-cut foam sheets are available at most home improvement stores. They might not blend seamlessly into the home décor but draft stoppers on doors are an economical and effective solution to warming a home. Sometimes called snakes due to their low proximity to the ground, draft stoppers close the gap at the bottom of a door. Draft stoppers can be purchased at home improvement stores or if you’re feeling crafty, there are many tutorials available online to make them. If you’ve been thinking about retiring older blankets around your home, make sure to upgrade them appropriately. Look for down-filled blankets and comforters with fill power ratings of 500 or 600. Other blanket characteristics to consider include the weave of the fabric. The fabric of a conventional blanket is woven tightly, allowing it to keep body heat close to the skin. Synthetic and wool blankets generally have a knit-style weave that is heavy and warm. It’s not uncommon for tiny gaps to develop between doors and window frames over time. Unfortunately, these gaps can allow in a significant amount of air unless the gaps are sealed with caulk or a weatherstripping kit. A way to find out if the doors or windows are lowering the indoor temperature is to shine a flashlight along the frame or sill. Have another person to stand on the other side — either inside or outside the home — and ask if they can see the light. You can also feel along the frame for moisture on rainy days. If light or moisture is observed, caulk or a weatherstripping kit can be purchased at any home improvement store and is a quick fix to a cold situation. 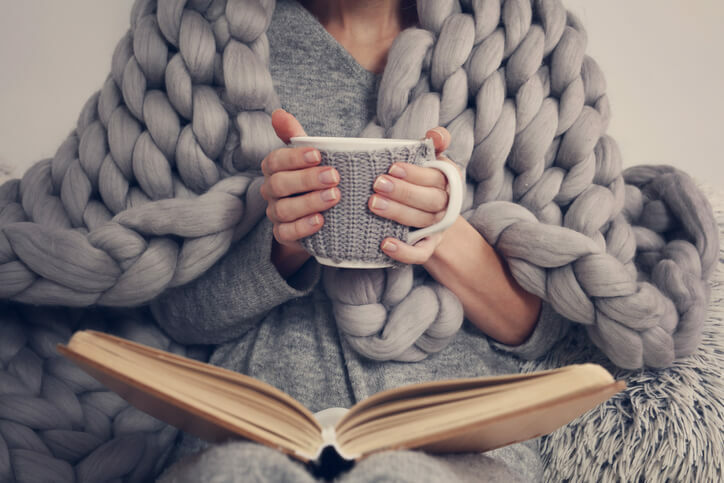 If you’ve tried one or several of these ways to warm up but are still feeling the chill indoors, call LIBERTYAIR for quality heating repairs in Gainesville, FL. Our technicians will quickly inspect and repair any malfunctioning HVAC system to help you and your home warm up quickly.